The Naga Hex V2 is a niche product, but it serves its niche well. The Naga Hex V2 gives strategy gamers tons of commands without overwhelming them. Do you need a mouse specifically designed for the kind of computer games you play? Razer seems to think you do, or at least that’s the message they’ve put into their marketing for the Naga Hex version 2. 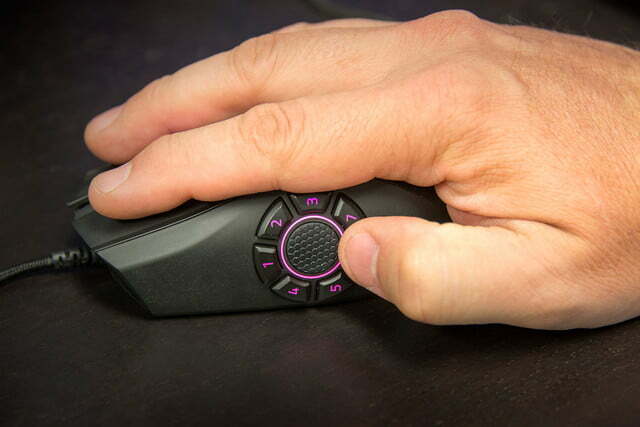 The mouse’s unique radial thumb button design was allegedly built just for MOBA (multiplayer online battle arena) games like League of Legends, DOTA 2, and Heroes of the Storm. The competitive fervor around this very specific genre is insane right now, so it’s not hard to see why Razer would revive the Hex, which hadn’t been updated since 2012. The Hex V2 is basically the same mouse as the Razer Naga, but it has a seven-button thumb wheel instead of a twelve-button grid. For gamers who find the vanilla Naga intimidating or confusing, or who simply need more than two thumb buttons but less than twelve, it’s a surprisingly elegant solution. The Naga Hex V2 uses a body shape that’s identical to the latest wired version of the Naga, the Naga Chroma, which uses Razer’s now-universal Chroma lighting system. Left-handed gamers, or those who prefer something wireless, are out of luck. The Naga’s body is both tall and wide, stretching out the DeathAdder shape to favor a heavier and more controlled grip. Notably, the mouse has a flare on the right side on which to rest your ring finger, whereas most Razer designs (and indeed most gaming mice in general) simply slope down to an edge. It’s surprisingly comfortable, so long as you don’t try to use a claw grip – the right thumb is reserved for fast and multiple actions. The body is both wider and taller than the original Naga Hex, or at least it feels that way, and the design and matte plastic material allow you to rest your hand on the body while pivoting your thumb to different positions on the left button wheel. Once you’ve learned its layout, the Hex V2 feels quick and responsive. In addition to the seventh button (which means the mouse really shouldn’t be called “Hex” anymore, should it?) the smooth, octagonal shape of the buttons has been shifted to a radial design. That seems to make them considerably easier to distinguish by feel. Each button can now be “felt” by both its position and orientation relative to the center thumb space. Aside from the thumb buttons, the mouse has Razer’s typical fast-click left and right buttons, a center wheel with a grippy rubber texture, and two on-the-fly DPI buttons at the tip of the body. There are no buttons on the side opposite the radial buttons, and that makes sense, as the user’s ring and pinky finger need to be kept stationary to ensure accurate thumb presses. Stylistically, the new Naga Hex is a serious improvement over the old one. While the original design had a glossy top with a garish full-color print in either red or green, version 2 adopts Razer’s new stealth fighter aesthetic, right down to the faux jet engine intakes in the front. The whole mouse uses a rough plastic texture that’s good for the grip, aside from a small rubbery patch for your thumb to rest on in the center of the button dial. 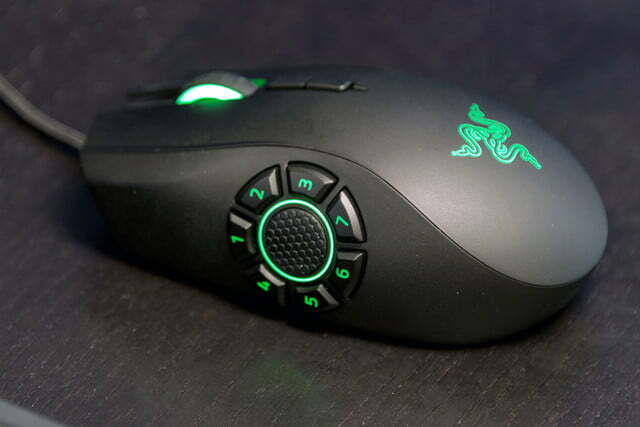 Chroma RGB lighting is found on the scroll wheel, illuminated number buttons on the radial with an inner circle, and of course the Razer logo at the tip. Using the Naga Hex V2 in-game was an interesting experience. For its intended games it makes quite a lot of sense, since the array of thumb buttons clears up the user’s left hand for more consistent action on the keyboard. Binding seven abilities to the thumb wheel is easy, as the buttons are bound to their corresponding number row values by default – pressing the “3” button in a word process will enter a 3, for example. Saying that acclimating to the layout is easy would be an exaggeration, but after a few hours of playtime it becomes second nature to find all seven distinct buttons with your thumb. That makes actions in MOBA and other management games incredibly straightforward. Some advanced players might wish for even more buttons, since some MOBAs include more than seven abilities at higher levels. They can opt for the standard 12-button Naga mouse, or simply deal with more keyboard controls. 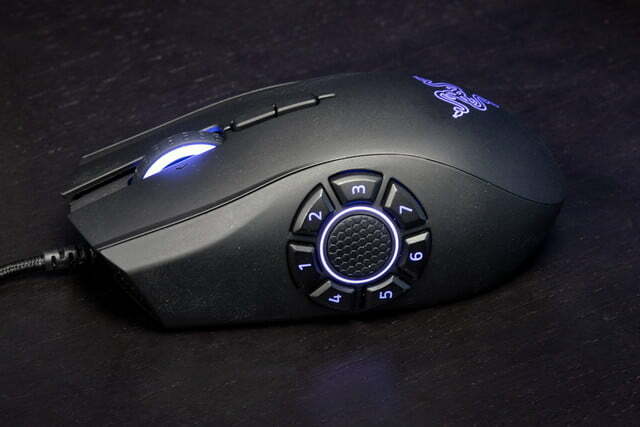 But that comes with a bit more confusion, too, since the standard Naga uses a 3×4 button grid. For fast, easy, and surprisingly intuitive ability activation in top-down strategy games, the Naga Hex v2 might just be the new king. You can’t say the same for all games, however. 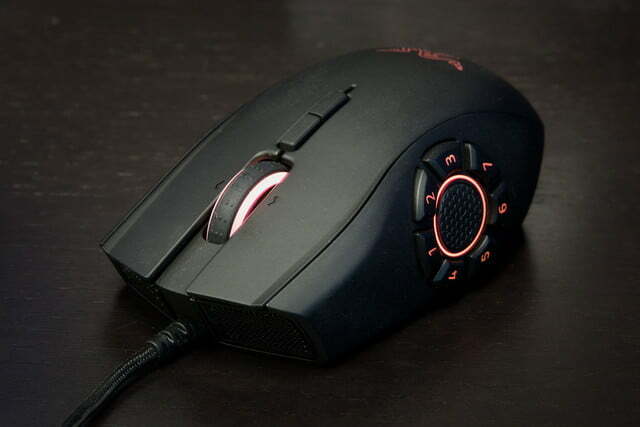 Shooters, which tend to assume only two extra mouse thumb buttons, are cumbersome on the Naga Hex. We found ourselves binding only three of the thumb buttons (grenade, melee, special attack in most cases), as using more in the frantic and extremely sensitive first-person view was a headache. Standard third-person games have the same issue, though a controller is often a more elegant solution in any case. The point here is that choosing the Naga Hex over a more conventional gaming mouse means favoring strategy game ergonomics over those of action games. If that’s a compromise you’re willing to make, then it scores an easy recommendation. Using the Naga Hex for more mundane tasks is functional if not surprising. 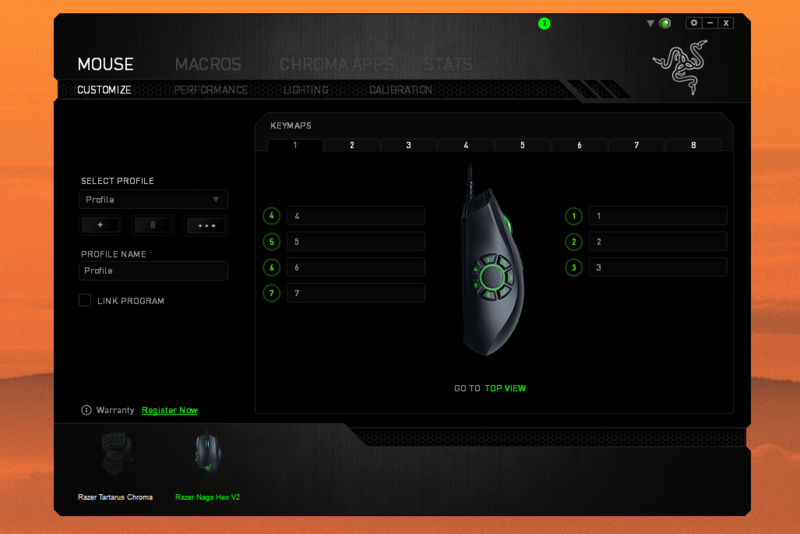 The horizontal scroll feature that Razer has begun including in its mouse designs is much appreciated for web surfing and media creation. It’s probably possible to bind the thumb buttons to common tools in more straight-laced computer programs, but we’re guessing that most people won’t care to re-learn the keyboard shortcuts they’ve relied upon for years. Razer Synapse isn’t getting any better. That’s discouraging, since it remains the weakest part of any Razer product. Synapse requires an Internet connection and a user account to customize any settings. That’s been true for years, but it isn’t any less annoying now. The lack of any local storage or settings on the Naga Hex v2, and other Razer products, isn’t helping. Beyond that, Synapse is serviceable. The software allows customization of all of the buttons, though with the smart binding of numbers to the radial buttons, most users won’t need it. 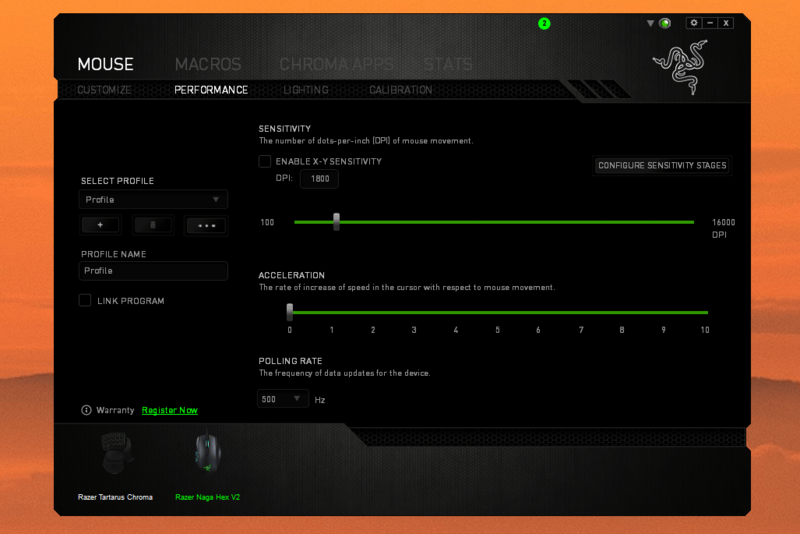 More important is the ability to customize acceleration, DPI (up to 16000, Razer’s top-of-the-line laser sensor), on-the-fly DPI steps, and polling rate, along with more esoteric settings like polling rate. 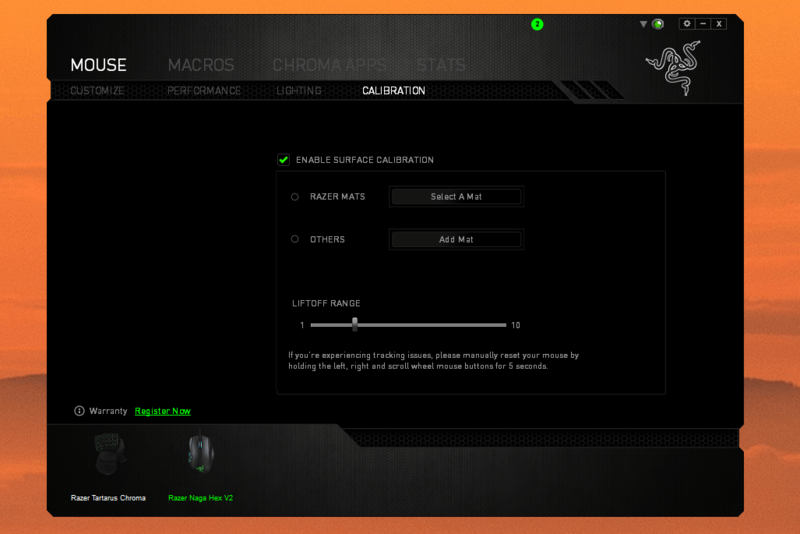 Macros and profiles can be set, and even activated with button binds. 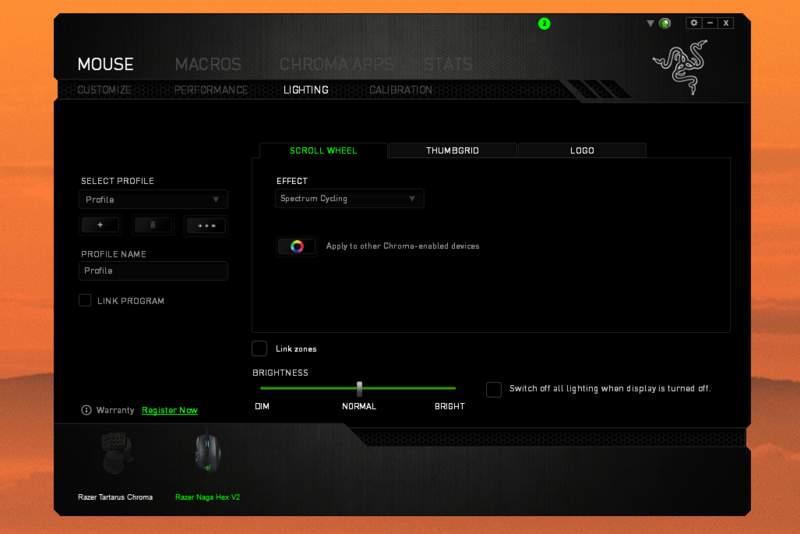 Lighting uses Razer’s Chroma Configurator tool, which is complex, but functional. 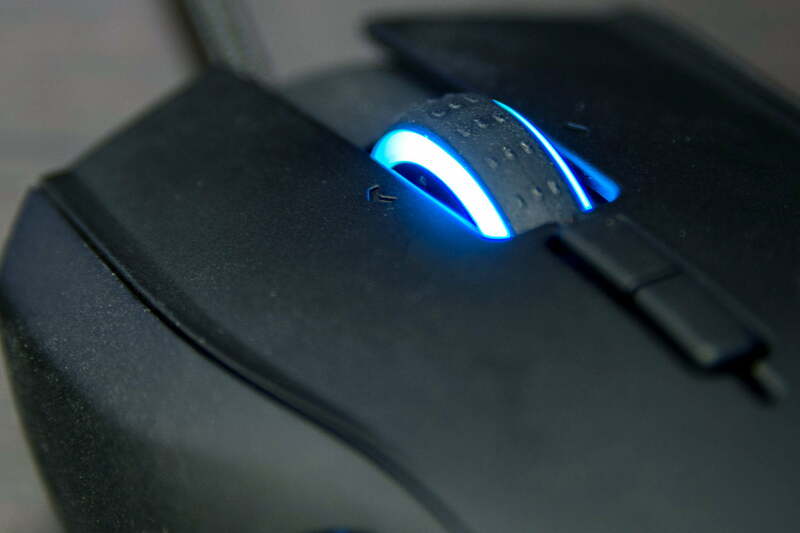 The Naga Hex doesn’t have the same customization options as the Mamba, since only the scroll wheel, thumb grid, and logo are individually tweakable, but it plays nice with any other Chroma-enabled devices you might have. At $80 retail, the Naga Hex V2 is in line with Razer’s other mice and the exact same price as the wired, Chroma-enabled version of the 12-button Naga. It’s also in line with similar MMO/MOBA mice like Logitech’s G600 or Corsair’s Scimitar, despite having a better sensor than both of them. Whether you can justify eighty bucks for a mouse specifically designed for only a few kinds of games is entirely up to you, but if you can, the Naga Hex v2 is at least as good as its competitors.